The search for the Shattered Star leads the PCs to Kaer Maga, the legendary cliff-top city of criminals, refugees, and anyone else seeking to vanish into its cluttered streets. Enlisted to rescue a troll prophet from a mad artificer's hanging mansion, the Pcs soon find themselves delving into the notorious Undercity. Here they must battle their way through a lost runelord laboratory before finally entering the mysterious cavern realm of the Dark Forest, where an ancient evil has guarded a lost shard for millennia. 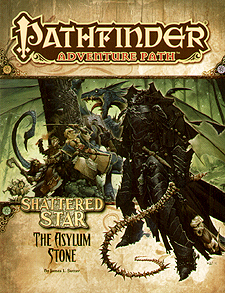 Can the PCs recover the shard from its unholy guardians and continue their quest, or will they simply be the latest souls lost to the City of Strangers?